I recently stumbled upon an image of crescent Earth taken during Apollo 4, on November 9, 1967. It was a beautiful shot, but not one I had ever seen, despite having trawled through the Apollo archives many times. Apollo 4 was the first test flight of the Saturn V rocket. It sent an uncrewed command module to high Earth orbit, where an engine burn sent the spacecraft hurtling back towards the ocean at speeds comparable to returning from the Moon. The entire mission lasted just eight hours. What I didn't know, until seeing that crescent Earth image, was that there was a camera in the command module window, timed to take pictures from an altitude of about 18,000 kilometers during the final orbit. In total, 755 pictures were taken, and 712 had some or all of Earth in the frame. The mission imagery report says they are the first color film photos taken from that altitude. You can find the low-res image thumbnails online, thanks to the Lunar and Planetary Institute in Houston. But curiously, I couldn't find any of the high-res images except a couple cropped excerpts scattered around the Internet. This is in stark contrast to the crewed Apollo missions, which have been exhaustively cataloged. 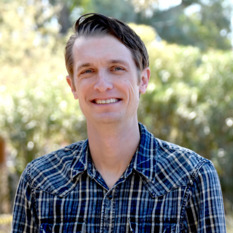 I got in touch with David Bigwood, who works at the LPI Regional Planetary Image Facility, one of several such facilities around the world that host physical and digital space mission imagery. David located the high-res versions, scanned from film. Unfortunately, the file set was huge, consuming a whopping 1.3 terabytes of disk space. David was kind enough to compress the TIFF files into smaller, 14000-by-16000-pixel JPGs, and send me copies. It took him more than a week, though I think (hope) that most of that was computer processing time, not manual labor. Thanks, David! 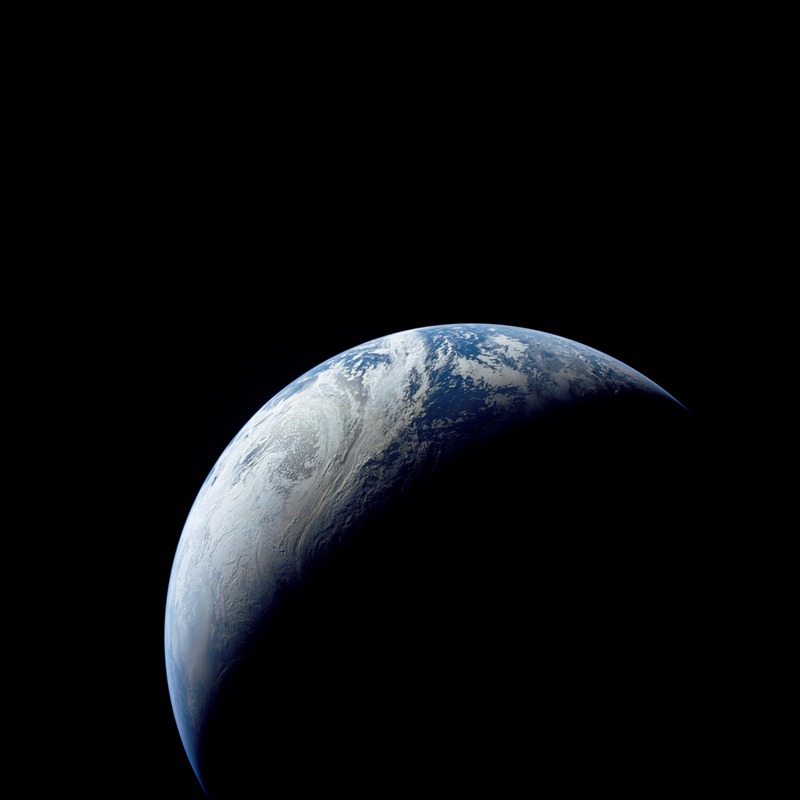 The Earth, from a height of about 18,000 kilometers, on November 9, 1967. The image was taken using an automatic camera mounted in the Apollo Command Module. 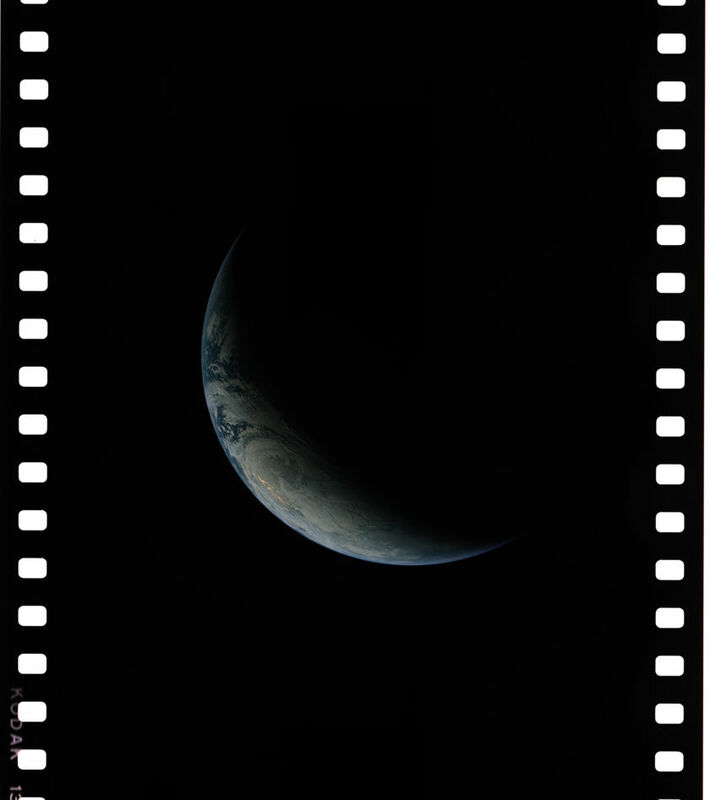 As you can see, Earth's position jumps around vertically from frame to frame—either due to the command module moving, the film advancing different amounts, the scanning process being non-uniform, or some combination of all three. I started to manually line up the images, but gave up after realizing how long that was going to take. As you can see, someone beat me to this idea three years ago! I don't know if the YouTube user, Patrick Koelewijn, was the original creator, but this is a much nicer video than my quick-and-dirty Final Cut Pro render. The description for that video says the source files came from the Johnson Space Center's Gateway to Astronaut Photography of Earth website. Armed with the original filenames from LPI, I was able to find the images individually on the JSC site. Here's the image shown on the LPI filmstrip I posted above: AS04-1-545. You'll notice it's much different! It's a smaller, cropped image, but not color-adjusted like the film strip. It looks more like an actual photo. I'm not sure how each image set came to be, but I'm happy to share the compressed JPG library from LPI. I originally tried to share it as a single, 36-gigabyte ZIP file on The Planetary Society's image server, but some of the files got corrupted, so I split the library into multiple files. Some of those files got corrupted, so I added two "missing" zip files to fill in the gaps. If anyone creates a new video based on these images, please let me know! Thank you Jason! That was a nice set of photos you selected. Trying the video was also a great idea. Those images were very nice. I had no idea that the flight test carried a camera in the spacecraft. The other video wass nice also. One question: which orientation of the planet is correct? I can't make out enough surface features to know. Did NASA let you know? The final video from the other party has the orientation opposite of yours. This set is amazing! I would love to make my own set but after multiple attempts, the zip downloads but says its incomplete, only a portion of al the pictures become available. Is there another way of downloading these awesome pics?